Aleksandar Radonjić je rođen 30. septembra 1977. godine u Zenici, BiH. Diplomirao je dva puta na Fakultetu tehničkih nauka u Novom Sadu, odsek za Elektrotehniku i računarstvo: prvi put 2003. godine na usmerenju Telekomunikacije, a drugi put 2004. godine na usmerenju Instrumentacija. Doktorsku disertaciju Merenja u frekvencijskom domenu u konceptu pametne distributivne mreže odbranio je 2013. godine, takođe na Fakultetu tehničkih nauka u Novom Sadu, odsek za Elektrotehniku i računarstvo. U zvanje naučnog saradnika izabran je 2015. godine. Zaposlen je u Institutu tehničkih nauka SANU od aprila 2015.godine. Oblasti interesovanja: zaštitno kodovanje, računarske komunikacije, inteligentna merenja. 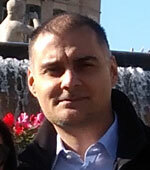 Aleksandar Radonjić je član međunarodnih inženjerskih tela IEEE, IEEE Communications Society i IEEE Internet of Things Community. B. Vujicic, L. Zupunski, P. Sovilj & A. Radonjic, "Reconstruction of an analog signal measured using two-bit stochastic digital measurement method", 17th IEEE International Conference on Smart Technologies, EUROCON 2017 - Conference Proceedings, Article number 8011227, 2017, pp. 829-831, https://doi.org/10.1109/EUROCON.2017.8011227. Aleksandar Radonjic, Vladimir Vujicic: "Integer Codes Correcting High-Density Byte Asymmetric Errors", IEEE Communications Letters, vol. 21, no. 4, pp. 694-697, Apr. 2017, https://doi.org/10.1109/LCOMM.2016.2644661. Vladimir Vujicic, Aleksandar Radonjic, Dragana Naumovic-Vukovic, Nemanja Gazivoda, Platon Sovilj: “Digital Measurement of Line Current with the Use of Virtual Short Circuit Method”, 22nd IMEKO TC-4 International Symposium on Understanding the World through Electrical and Electronic Measurement and 20th International Workshop on ADC Modelling and Testing, Iasi, pp. 261–265, Sept. 2017. Aleksandar Radonjic, Vladimir Vujicic: "Integer Codes Correcting Spotty Byte Asymmetric Errors", IEEE Communications Letters, vol. 20, no. 12, pp. 2338-2341, Dec. 2016, https://doi.org/10.1109/LCOMM.2016.2598803. P. Sovilj, B. Vujicic, A. Radonjic, D. Pejic, V. Vujicic, "Stochastic measurement of reactive power using a two-bit A/D converter", in: 21st IMEKO TC-4 International Symposium on Understanding the World through Electrical and Electronic Measurement, and 19th International Workshop on ADC Modelling and Testing, Budapest: IMEKO-International Measurement Federation Secretariat, 2016, pp. 176–179. Aleksandar Radonjic, Karlo Bala, Vladimir Vujicic: "Integer Codes Correcting Double Asymmetric Errors", IET Communications, vol. 10, no. 14, 1691-1696, Sept. 2016, http://dx.doi.org/10.1049/iet-com.2016.0097. Marjan Urekar, Aleksandar Radonjic, Vladimir Vujicic: “A Generalized Approach to Stochastic Measurement of Power Grid Frequency”,18th International Symposium on Power Electronics, Novi Sad, T4.1-6, pp. 1-6, Oct. 2015. Aleksandar Radonjić, Platon Sovilj, Vladimir Vujičić: “Stochastic Measurement in Fourier and Wavelet Domain: a Comparative Study”, 1st International Conference on Electrical, Electronical and Computing Engineering – IcETRAN 2014, Vrnjačka Banja, MLI1.3, June 2014. Vladimir Vujičić, Aleksandar Radonjić, Bojan Vujičić, Željko Beljić: “Stochastic Measurement of the Spectral Power Density of Low-Frequency Noise Generated by Graphene-Based Chemical and Biological Sensors – Case Study”, 1st International Conference on Electrical, Electronical and Computing Engineering – IcETRAN 2014, Vrnjačka Banja, MLI1.4, June 2014. Vladimir Vujičić, Željko Beljić, Platon Sovilj, Aleksandar Radonjić, Zoran Mitrović: “Concept of Stochastic Measurements in the Fourier Domain”, IEEE 16th International Conference on Harmonics and Quality of Power, Bucharest, pp. 288-292, May 2014. Aleksandar Radonjić, Platon Sovilj, Vladimir Vujičić: “Measurement Uncertanity Bounds of DSM Method”, IEEE Conference on Precision Electromagnetic Measurements (CPEM) 2012, Washington, pp. 572-573, July 2012. Aleksandar Radonjić, Vladimir Vujičić: “Application of a New Class of SEC-DED-BED Codes in Intelligent Instrumentation”, 15th International Symposium on Power Electronics, Novi Sad, T4.2-9, pp. 1-4, Oct. 2009. Aleksandar Radonjić: “Control of Industrial Systems Based on IP Addressing”, 15th International Symposium on Power Electronics, Novi Sad, T4.2-8, pp. 1-4, Oct. 2009.